Following the 34-7 defeat to Melrose on Saturday, Hawick RFC have announced head coach Nikki Walker will leave the Mansfield Park club after three seasons at the helm. 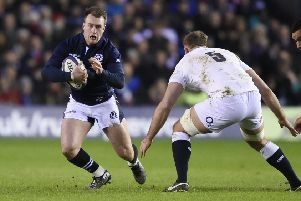 The former Scotland and Ospreys star, who joined the club as a player in 2013, replaced former head coach Phil Leck after the Englishman departed in surprising fashion following the conclusion of the 2013/14 season. “The club would like to thank Nikki for his contribution for the last three years,” said club president John Thorburn. In his three years in charge, Walker brought the club its first piece of silverware in eight years with a Border League title while in that same 2015 season he took the club to the cusp of the league play-offs and finished runners-up to Boroughmuir in the BT Cup final. The current 2016/17 season has been a test for Walker with the Robbie Dyes languishing at the bottom of the BT Premiership for most of the year. A mid-season spring helped earn results over Watsonians, Heriots and Glasgow Hawks which would give the Greens hope. Wins in the Border League and BT Cup followed and Hawick, after a season saving victory over Gala that relegated the Maroons, earned themselves a relegation play-off berth. Walker will continue as head coach during the Greens’ relegation play-off match and through sevens season. No announcement has been made on the future of assistant coach Scott MacLeod.